We’re proud to announce the launch of our ground-breaking NEW abrasive disc and accessory range. 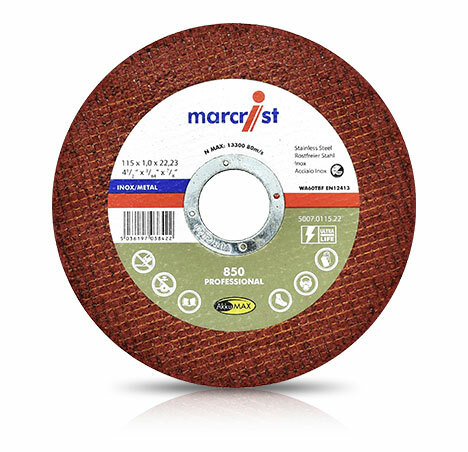 Our Marcrist Premium Professional 850 cutting disc range that provides consistent clean performance cut after cut, even in the most demanding applications. Your customers will be able to complete over six times more cuts than leading alternatives, as well as producing up to four times less debris whilst cutting. Our Marcrist Standard 350 cutting disc range that offers unbeatable value for money, combining high performance and staying power – overall a top performing disc that helps to keep costs under control. Interested in stocking our fantastic new range? Contact your local sales representative to discuss all of our stocking options, or simply give our customer service team a call on 01302 890888. If you want to find out more about the range, grab a cuppa and click below to have a read through our new abrasive guide.